Page by page, we were increasingly touched by Letícia Lampert’s work. 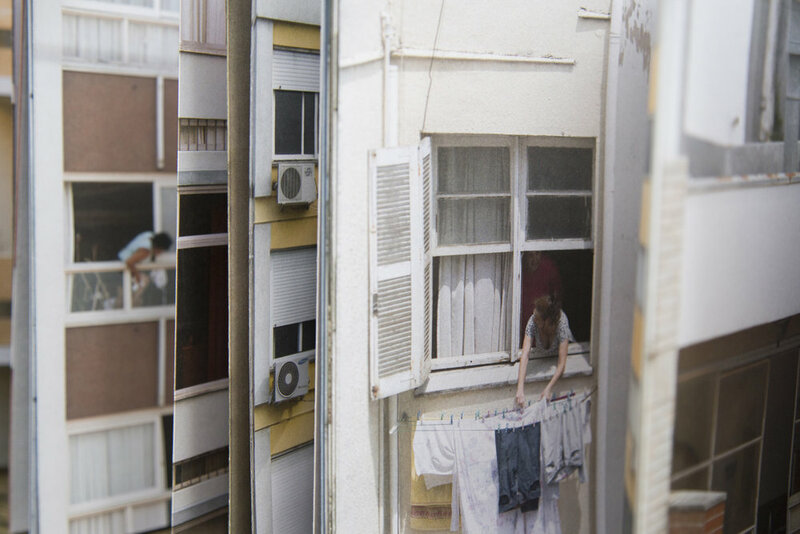 “Known By Sight” is a study of an increasingly super ordinary situation in densely populated cities, where residential blocks are built so close together that the view from the windows are vignettes of their neighbour’s lives. It’s fascinating to get a sense of how in such crowded conditions “Neighbors who don’t formally know each other… can make long descriptions about each other’s daily habits”. The work was created with the stories and generosity the people living in more than apartments within the narrow streets of Porte Alegre in Brazil. Their stories and Leticia’s photography and sensitivity offers a revealing study of these unique relationships established in the city. “Neighbors who don’t formally know each other… can make long descriptions about each other’s daily habits”. It’s interesting to note how the different residents proclaim their privacy non-verbally. Some have net curtains on every window, others have them only on a specific windows. Whilst others seem completely unworried and accepting about being seen going about their daily lives. As more and more people move into our cities and space becomes ever more of an issue, situations like this will be increasingly Super Ordinary. There are a lot of elements in “Known By Sight” that strike a chord with us. Our previous home, in London was in an apartment block with large windows that faced into an internal courtyard. Although we couldn’t see right into our neighbour’s homes, we could see enough to sometimes get a little sense of their lifestyle. For example, we could tell when occupants were students, we could make a good guess what music our neighbours liked. That people opposite loved palms and pink lighting, the people with the red light in their bedroom probably worked with plants - they had sooooo many. There were a few cat ladies, for sure. The people adjacent and a few floors up definitely had kids. Little things like that build a sense of familiarity even though, I have to admit, I couldn’t tell you what most of these people look like let alone their names! Focussing on the aspect of being able to look into someone’s home, we cannot help but think of the residents of Neo Bankside in London and their battle with the Tate Modern. There, the residents were less able to accept the peering glances of visitors to the Tate Modern as part of life and more as an invasion of their personal space and privacy and they (unsuccessfully) sought court action against the gallery [SOURCE]. Perhaps they would have been more tolerant of the so-called intrusion had the Tate not been such a huge public attraction and just another block of flats occupied by similarly financially wealthy people? Hiro currently works in a tall building in Shibuya and his office window looks right into someone’s apartment. Whilst these residents have put up a net curtain to protect their privacy, what is more interesting is how Hiro’s office impose a visual curfew by automatically bringing down the blinds in the office at around 4pm in consideration of the residents in the opposite buildings. Unfortunately for Hiro, who is far more interested in the sunlight than what his neighbours are doing, this means that he can’t see the sunset over Tokyo from his elevated position. Ah well!